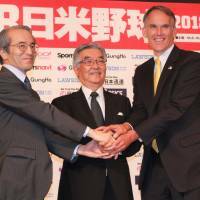 Yomiuri Giants Sawamura Award-winner Tomoyuki Sugano, popular sluggers Yuki Yanagita and Yoshitomo Tsutsugo and other star Nippon Professional Baseball stars will suit up in the Samurai Japan jersey against a team of major league all-stars in an exhibition series this fall, organizers announced Monday. It was also announced that Miami Marlins skipper Don Mattingly would lead the MLB corps as their manager for the series, which is widely known as “Nichibei Yakyu” among Japanese baseball fans. Tokyo Dome will host three games between Nov. 9-11, while Hiroshima’s Mazda Stadium will stage one on Nov. 13 and Nagoya Dome two on Nov. 14 and 15. All games will be played at night. The Atsunori Inaba-led Samurai Japan will also have Hiroshima Carp infielder Ryosuke Kikuchi, Seibu Lions outfielder Shogo Akiyama and Yokohama BayStars reliever Yasuaki Yamasaki on its roster. The major league team roster has not yet been announced. Jim Small, MLB’s vice president for Asia Pacific, appealed for understanding that it is “much, much more difficult” to put together an all-star team from the big league because there are many hurdles to overcome. Asked if Japanese sensation Shohei Ohtani, of the Los Angeles Angels, could potentially be on the MLB team, Small was noncommittal. Small also said that the MLB has always dispatched “spectacular” squads to Japan for Nichibei Yakyu, insisting that fans should expect the same this time. According to Small, since the series kicked off in 1986, there have been 30 players who have won MLB MVPs, 40 batting champions, 33 home runs kings and 22 Cy Young Award winners, while a total of 20 have gone on to become Hall of Famers in Cooperstown. Japan won the last series, in 2014, 3-2. The Japanese side played as the national team and will again do so this year. The 2018 edition will serve as a development opportunity for Samurai Japan toward the 2020 Tokyo Olympics as well. 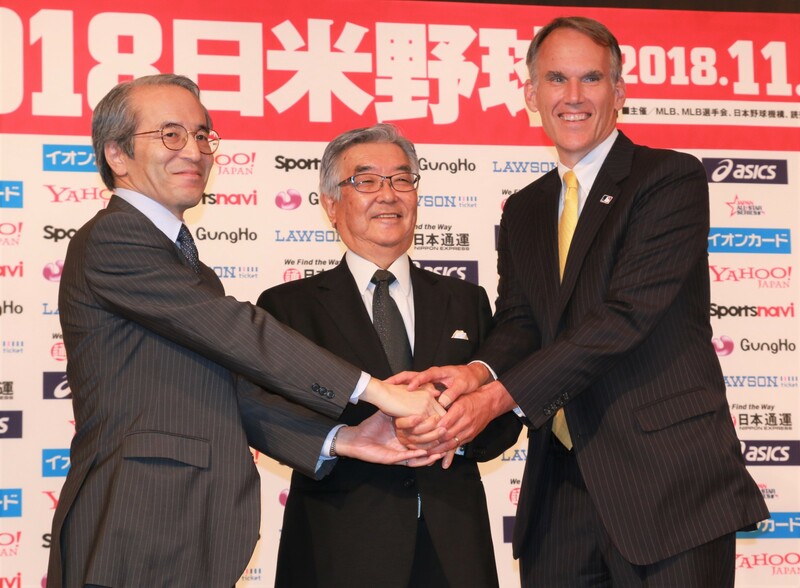 “We are hoping (Samurai Japan) will win every game,” NPB commissioner Atsushi Saito said. Besides Nichibei Yakyu, the major league team will also take on the Yomiuri Giants in an exhibition at Tokyo Dome on Nov. 8, while Samurai Japan will play a warmup contest against the Taiwanese national team at Fukuoka’s Yafuoku Dome on Nov. 7. For Nichibei Yakyu, a total of 28 players on each team will be allowed on the bench. The major league ball will be used when the MLB team is on defense and the NPB ball will be applied when Samurai Japan on defense.